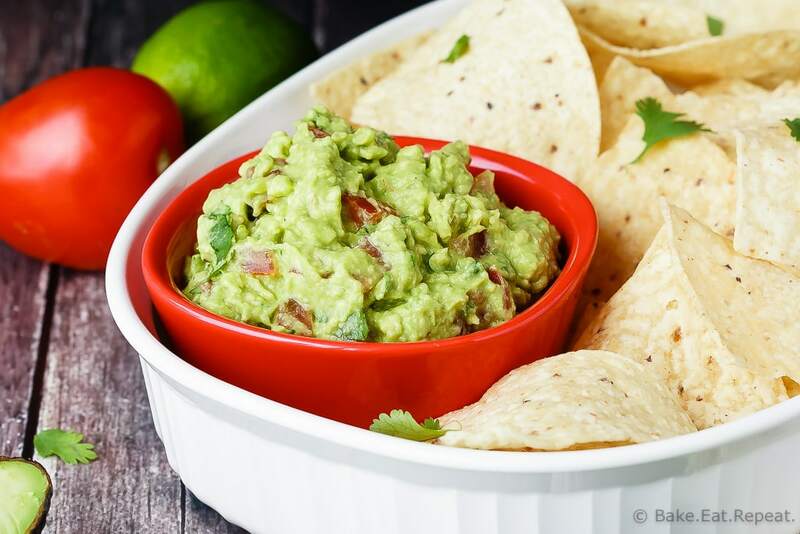 Quick and easy guacamole – so easy to make and so good that you will never want to buy it again! It’s the perfect snack or appetizer! Guacamole. One of my favourite things. Oddly enough, I used to hate it. I’m fairly certain I formed that opinion when I first saw it and determined that anything green couldn’t possibly be good. Not sure why, I liked other green things. But guacamole was clearly not worth trying. Because it was green. Based on the evidence of the last ten years with my own kids, this is a normal response for children to have to guacamole. Green? Not touching it. But sure, I’ll have some broccoli. Completely reasonable and logical – as we know all children are at all times. Right. But! That means that when I make the glorious green stuff, I only have to share it with my husband. I’m kinda okay with that. My kids eat lots of veggies, I can’t say it bothers me too much that they won’t touch avocado. More for me! 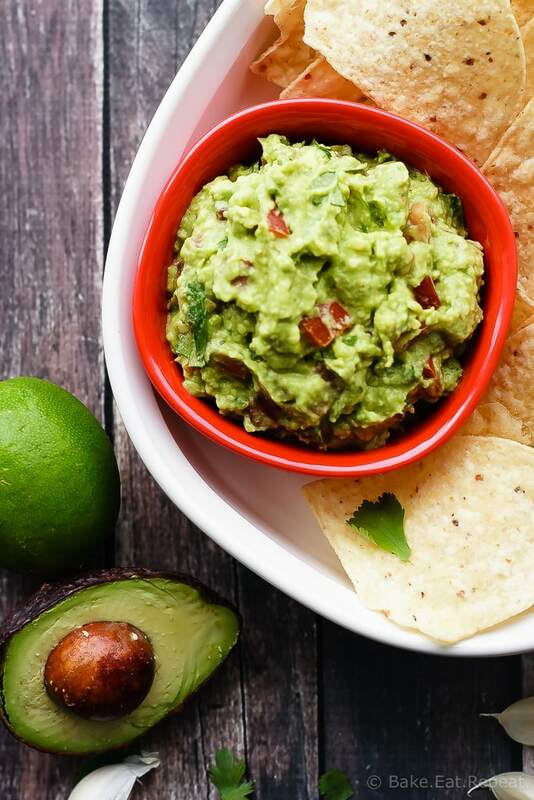 This guacamole recipe is super fast, super easy and tastes fantastic. If you’ve never made your own guacamole, you have definitely been missing out. The stuff you buy in a little tub at the store can’t even begin to compare. I’m a firm believer that homemade is always better, and it is definitely true here. Five to ten minutes and you have the perfect snack. Plus an hour to chill if you want the flavours to meld and stuff, but I’ll be honest – we usually don’t bother waiting. It’s all good. We like ours with lots of garlic and cilantro (okay, I like lots of cilantro, my husband puts up with it) but feel free to adjust the recipe to your own tastes. Easy, perfect guacamole. I’m glad I decided to try it. 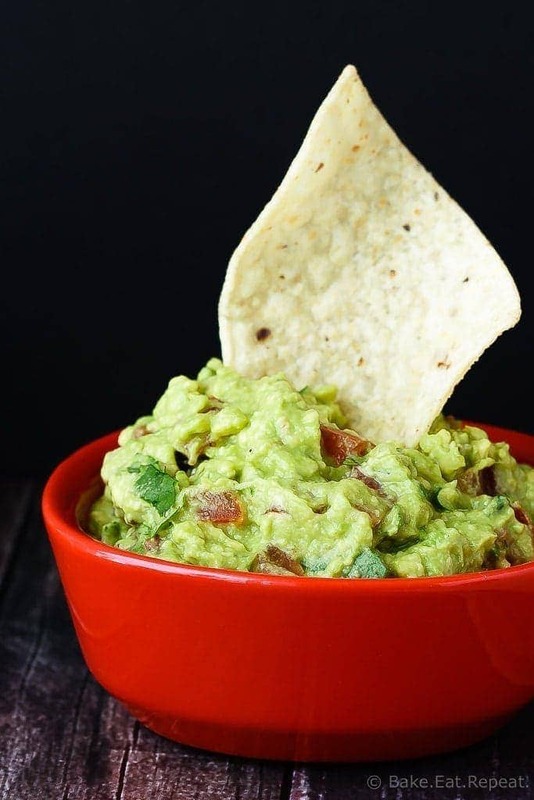 Quick and easy guacamole - so easy to make and so good that you will never want to buy it again! It’s the perfect snack or appetizer! In a medium bowl, mash the avocado flesh with the lime juice until smooth. Stir in the chopped tomatoes, garlic, cilantro, jalapeno (if using) and the salt and pepper until well combined. Refrigerate in a sealed container for 1-2 hours to allow the flavours to combine before enjoying (if you can wait that long!). I sometimes use the jalapeno, sometimes don’t, it’s great either way. Also, it IS a bit better if you let it refrigerate for an hour or so before eating it as the flavours combine, but we often don’t wait more then about 2 minutes and it’s still fantastic! Yum!! These is nothing like a good, classic guac recipe! Especially when you have perfectly ripe avocados. This looks so good-- I want some! !